Learn how to make your own writing journals and published works using the binding technique know as Coptic Stitch. This technique results in a hardcover book with an exposed spine. The book is comprised of sections (signatures) that are linked together during the sewing process. While we will construct decorative covers in the class, the focus will be on the sewing technique – once you have this down, the cover design opportunities are truly endless! 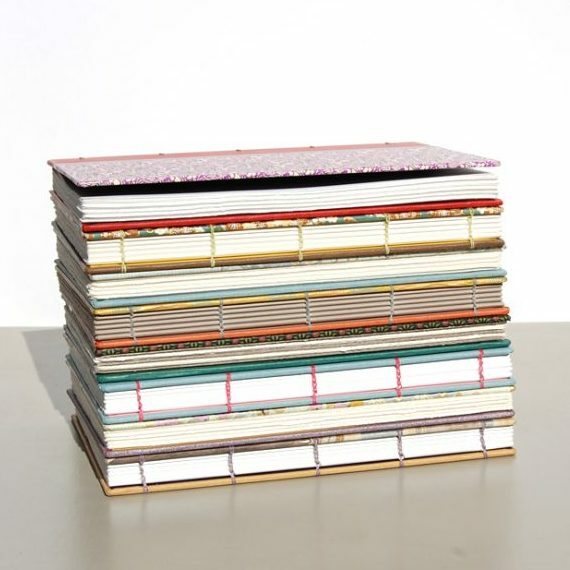 The class includes a bookbinding kit with all materials for your first book including a detailed booklet that illustrates the process, material sources and the opportunity to purchase bookbinding tools at a discounted price. Class taught by Jennifer Roberts of Handsome Goods.